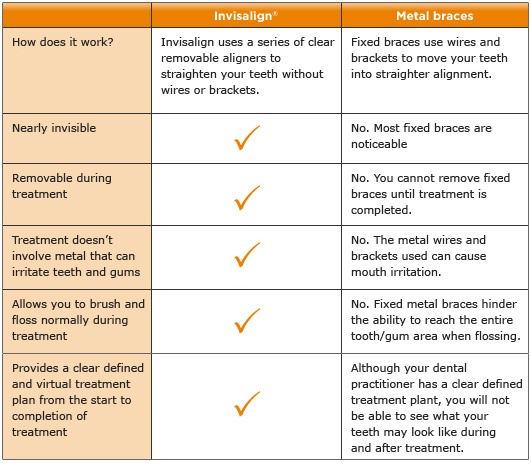 Invisalign offers a range of advantages over conventional orthodontics, these are summarised in the table below. Adults often prefer Invisalign over the conventional metal train track braces because Invisalign is removable meaning you can take it out to clean and whilst you eat. This makes the whole orthodontic process somewhat more comfortable and socially acceptable. Because Invisalign is also clear it means that most people won't even know that you are having orthodontic treatment, this is particularly useful if you have a high profile job or where your role involves you meeting other people often. Put simply, Invisalign is a series of clear plastic aligners which are digitally produced using the most modern computer technology. Each aligner moves your teeth a small amount towards their final destination. Each aligner is one for approximately 2 weeks when you will replace it for a new one. The whole process takes approximately 18 months to 2 years. We have also created a free guide which will answer the most common questions everyone has about these treatments, our guide is free and available for immediate download. "What you absolutely need to know about orthodontics before starting treatment"
In order to help you find out more about orthodontics and teeth straightening we have created a comprehensive downloadable PDF guide. The document is free and available for immediate download. How do almost Invisible Braces work? What do the procedures involve? Are these treatments suitable for you? All orthodontic treatments work by applying the correct amount of pressure to a specific section of the tooth in order to move, tip or twisted in the direction required. Maintaining this constant pressure means the teeth end up moving. Normally this is done with fixed orthodontics where we use teeth as anchors to move other teeth. In the case of Invisalign this pressure is applied to the two using a clear, transparent orthodontic aligner. 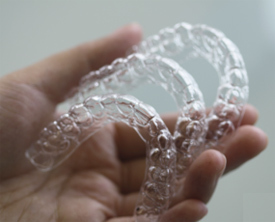 These aligners are made using computer technology to both design and manufacture. The skilled orthodontic technicians can then move your teeth digitally on the screen into their new positions. 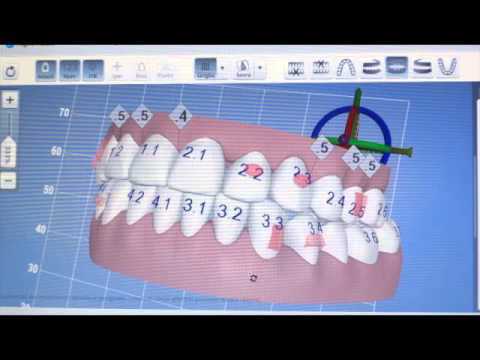 The software then calculates the distance between the starting position and finishing position and works out how many aligners will be required. The computer technology then manufactures these clear aligners, each one putting a small amount of pressure on your teeth in the correct position and correct direction in order to move it a small amount. You replace your aligners approximately every two weeks, each aligner moves your teeth small amount towards their final destination. What if You Choose Invisalign? Invisalign also gives you your perfect smile. It has been found in studies that most people notice your smile first when they meet you for the first time, so having a confident smile is something that works for you and you can enjoy the rest of your life.